If your enjoyment of a good Shiraz or Chardonnay has ever been delayed by having to hunt through the kitchen drawers for a corkscrew, help is at hand. A new invention combines the tradition of a cork stopper with the convenience of a screw cap, meaning summer picnics and romantic dinners could be just a little bit simpler from now on. The Helix is an old-fashioned cork stopper – but it has a screw thread that drinkers can twist in and out of the neck of the bottle. It comes with a bottle which has a matching thread, so it can be tightly resealed to keep the contents fresh. The innovative design is the result of a joint effort by Amorim, the world’s largest wine cork manufacturer, and O-I, the biggest global maker of glass containers. They are optimistic that it could be seen on shelves soon. The companies claim wine stored in the Helix tastes no different to a classic bottle – and important markers used by critics to judge wine, such as colour and smell, are also unaffected. They say wine from the bottles has gone down well with tasters in the UK, US, Australia and China. Unlike other devices designed to keep wine fresh once it has been opened, the Helix cork can also be used for champagne, resealing it so well that a partially empty bottle will still produce a satisfying pop when it is opened. Antonio Amorim, chairman of Amorim, said: ‘Helix meets consumers’ growing desire for sustainability and quality. His family firm is more than 140 years old and supplies traditional corks to 82 countries. Based in Portugal, it makes use of the country’s huge areas of cork oak forest. In recent years, manufacturers have increasingly turned to cheap and easy-to-use screw caps, particularly for lower priced wines. 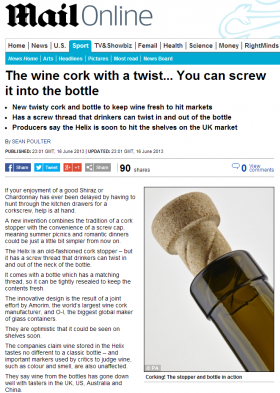 But if the Helix proves successful, it could make a traditional cork – which some experts say improves the wine’s flavour – just as convenient as a metal cap.